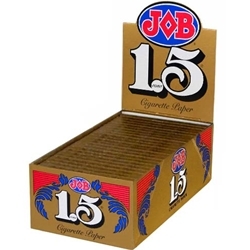 JOB Rolling Papers Light - 1.5, are 60mm in length, created with 100% pure rice paper with each leaf naturally gummed, allowing for a smooth and clean burn with every use. Created by Frenchman Jean Bardou in 1838, each booklet features the famed Job logo on the front. Click Here HOME PAGE and find other great products we offer!